hile in flight school I continued my career as a mechanic, as well as gained the skills and knowledge needed to earn my pilot certificate. My first pilot job was flying tours in sunny Florida, where I was also performing the scheduled and unscheduled maintenance on our aircraft. 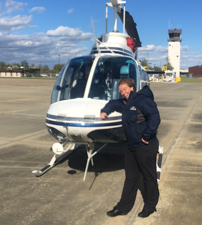 As much fun as that was, I am very happy to be a part of the HeloAir team and looking forward to all the adventures to follow.